EXPERIENCE: Forty-three years and over 250,000 accident-free miles (except for one not-at-fault occurrence) as a licensed motorcycle operator. Completion of Motorcycle Safety Foundation Beginner and Advanced Rider Courses and Keith Code's Superbike School. Forty-six years as an off-road rider. A.A.S. - Mechanical Engineering with over 25 years professional mechanical experience, first-aid, life-saving and CPR training. My extensive solo travels have honed my map and people reading, decision-making and situation-evaluation skills. My leadership roles have refined my arbitration and people-management skills and my lead-by-example style has evolved into an ability to lead others in a way that they think they are leading themselves. Most important is my desire to share the joys of motorcycling. I can lead anyone from beginners to experts at the appropriate pace. I have taken many people for their first motorcycle ride and have taught more than a few, including women, how to ride. GEOGRAPHIC EXPERIENCE, ON-ROAD: Thirty-seven of 48 contiguous U.S. States, five Canadian provinces, Isle of Man, Ireland, and Spain. Extensive knowledge of the Mid-Atlantic, New England, and Southeastern US states. Extensive travels in England, Scotland, Spain and Portugal. GEOGRAPHIC EXPERIENCE, OFF-ROAD: Mid-Atlantic States, Massachusetts, Vermont, and Tennessee. George Washington, Thomas Jefferson, Monongehela, Wayne and Allegheny National Forests. Ten Pennsylvania State Forests. AMATEUR COMPETITION: Enduro riding - 10 years of East Coast Enduro Competition. Dual Sport Riding - 13 years and 45,000 miles. Motocross and road racing support - 4 years. LEADERSHIP ROLES: President (1995-2011) - Turbo Motorcycle International Owners Association (TMIOA), North Eastern Region Vice President (2000-2007), and Pennsylvania State Director (1994-2007) - Honda Sport Touring Association (HSTA). Dual Sport Route Coordinator- HSTA Sport Touring Association Rendezvous `96 (Davis, WV). Rally Coordinator -Thumpers and Twins Rallies ('97-'98), Thumper Humper Events ('97-'02), PA Adventure Rallies '95-`07, PA Dual Sport 300 Rallies ('94-'07), Pennsylvania 500 Rallies ('05-'07), and Turbo Rallies ('95, '06, '10-'11). Organizer of the 2001 HSTA's Sport Touring Association Rendezvous - a 400+ participant 3-day international event held in State College, PA.
PUBLISHING CREDITS: Ten books with photos on CD (2006-2017). Nineteen Motorcycle Road Trips, Motorcycle Dual Sporting, and Motorcycle Safety Kindle ebooks (2009-2017). Bi-monthly on and off road riding column for Winding Road Motorcycle Times (1999-2011), Motorcycle Times (2012-2017) and monthly for CC Motorcycle News (1999-2001), and Backroads (1997-1998). Bi -monthly newsletter, Sport Touring News, for HSTA (1994-2007). Resurrection and reorganization of the TMIOA (1995-2011) and Turbo News (1995-2003) - the quarterly publication of the TMIOA. Motorcycle Grand Prix and MotoGP coverage for Winding Road Motorcycle Times (1997-2000), Isle of Man features for American Road Racing (1997-98), CC Motomag (January 1998), Rider (March 1998), and Twistgrip (Spring 1998). Event coverage for Thumper News (Fall 1998). AMA National event coverage for CycleNews (May 1998) and TrailRider magazine (1996-2000). Seven-time Getaways and Street Savvy columnist Motorcyclist magazine (1996-2011). Turbo motorcycle retro-review for PowerTech Quarterly (Fall 1996) and contributor to Joe Haile's technical and reference coffee table book Turbocharging, Supercharging, and Nitrous Oxide (Whitehorse Press - 1997). Original concept for Turboville! feature article in Motorcyclist (November 1995). 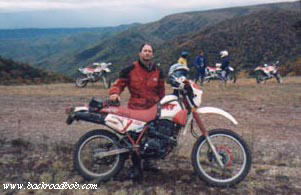 Series of on and off-road articles for Winding Road MotorcycleTimes (1994-1998). Over 600 articles and over 500,000 words published. PHOTO CREDITS: Winding Road Motorcycle Times (1994-2011), Motorcycle Times (2012-2017), Twistgrip (1998-2000), CC Motomag (1998-2000), Rider (1998), Backroads (1997-1998), Motorcyclist magazine (1997-1999) and Backroad Bob's Motorcycle Road Trips, Motorcycle Safety, and Motorcycle Dual Sporting CDs (2006-2017). Cover photos for Blue Ribbon Coalition (July 1997), Winding Road Motorcycle Times (January/February 1996, January/February 2006, July/August 2007, September/October 2008, November/December 2009), and Motorcycle Times (March/April 2014, March/April 2017). Over 1300 photo credits. Copyright 2006-19 RHM Company Intl.